Which type of housing is right for your horse? 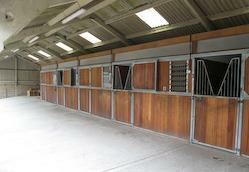 Horse housing can be indoor or outdoor housing, or a combination of both. The type of housing will be dictated by the use of the horse on a day-to-day basis or the preference of the owner rather than by the breed of horse. Unless there is adequate pasture to allow horses freedom at all time, then housing must restrict access to pasture. All horses should be protected from the inclement weather. Numerous decisions have to be made when designing a barn. Safety is the number one priority to take into account. Unprotected light bulbs, doors with sharp edges and slick flooring can cause accidents. You will also want to consider location, climate, zoning, water, ventilation, feed storage, tack storage and financial costs. It is easy to see that there are quite a few factors to consider before a horse ever steps into a barn. A good barn is an important part of keeping a horse healthy. 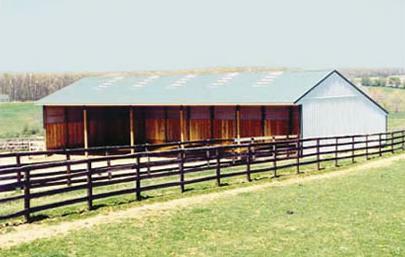 Barn design and management can have direct effects on the health of horses. The horse’s respiratory system can be put at risk by a poorly designed barn. The risks of other diseases and indeed direct physical trauma can be increased by poorly designed barns. Barns themselves aside, problems may also arise from the design and positioning of ancillary buildings, such as feed-storage areas. Surfaces in barns, passageways and walks around barns can also increase the risk of disease and injury. Indoor housing is ideal for horses that are being ridden or used every day in the winter time. Traditionally, you will have individual box stalls and this system will require a considerable amount of daily labor for manure removal. 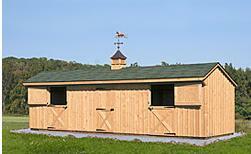 The single story barns are the best option since they are cheaper to build and maintain. Hay storage should be considered in a separate barn and you should contact your local fire department for advice on regulations and suggestion on fire barrier placement. A miniature horse - a 6' x 8' stall. Ponies and small horses, under 900 pounds - 10' x 10' stalls. But if you have the room, you might want to make the stalls 10' x 12' or 12' x 12' to make the barn more versatile and more appealing to future buyers who might have larger horses. Riding horses, 900 to 1100 pounds- 12' x 12' stall, which is the industry standard. A Warmblood or a small draft - 12' x 14' to 14' x 14'. A large draft horse - 16'x16' stall. A foaling stall should be at least twice the size as a single stall for that size horse. Standing stalls are where the horse is tied forward with a chain or rope. Horses can also stand loose with two chains across the open end. Many draft horses are kept in standing stalls. They are not as comfortable for the horse since they are limited in movement. Open-sided or free-stall housing is good to use when you want to maintain horses in the open-air while providing protection from inclement weather. This type of system is used to house a group or horses that get along well with each other. Run-in sheds are often used. Open shed rows are similar to box stalls in a row but the doors are open to the outdoors. Most doors are Dutch Doors, split to allow the top half to be left open for ventilation purposes. This works best in mild climates. The advantages to outdoor housing are lower construction costs of the buildings and less labor when it comes to cleaning the building. When considering outdoor housing for horses, you can consider a three- sided structure or a more elaborate open barn. You can purchase a skid steer to clean the barn and thus cut back on the need for the wheel barrow and manure fork. Remember to feed (hay) horses at least 150 meters from the barn to cut back on manure in the barn and the horses will fight less for feed in an open area as compared to the confined space in a barn. See the images at the top of the article for some examples of housing. A well-lit barn is easier to work in and you will find that fewer horse flies will congregate. Window and skylights provide natural (and free) light, but be careful that they don't let in unrelenting summer sun. If possible, put a light in every stall. Do NOT install any kind of lighting with exposed components. The fencing you choose should be safe and adequate. All horses should be allowed as much outside, free exercise as possible. The fencing should be sturdy especially when the horses leans or rubs against it. Wood fencing is the most eye appealing but costly and the maintenance can be labor intensive. Poly vinyl chloride (PVC) fencing is becoming increasingly popular because you can get the look of wooden fence, without the maintenance. But PVC is a more expensive option than many of the others. High tensile fence is an economical option, but is not recommended for line fences. It is important that when using any type of electric fence that it is visible to the horse, and the horse perceives it as a barrier. If the horse becomes tangled in the wire, serious injury to the horse can occur. All fences should be at least 4 feet in height. For foals and/or miniature horses, and some ponies, the bottom rail should be set at an appropriate height as to discourage smaller or curious animals from rolling or getting caught underneath it. Keep in mind that your horse barn design should be safe, practical, aesthetically pleasing, comfortable, and an efficient place for horses and people. Keep these factors in mind when you are building or refurbishing a horse barn. You'll save time, money and labor and make your barn a place where you and your horse will love to be! Factsheets in this series were prepared by Stephen Herbert, Masoud Hashemi, Carrie Chickering-Sears, and Sarah Weis in collaboration with Ken Miller, Jacqui Carlevale, Katie Campbell-Nelson, and Zack Zenk. This publication has been funded in part by Mass. Dept. of Agricultural Resources in a grant to the Massachusetts Farm Bureau Federation, Inc. and by Mass. Dept. of Environmental Protection, s319 Program.